The happiest time of your life can begin here and now! Life is great at any age, and there is so much going on for you now. Looking good and feeling good is always a solid health practice, and taking care of your dental needs is still essential. Eat right, exercise regularly, and see your dentist for regular checkups. With your fabulous smile, you will still be taking the world by storm! 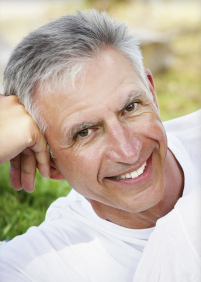 Studies show that approximately 75% of adults over 35 have some periodontal disease. Your dentist can help you to prevent this or can treat this if needed. 63% of “boomers” aren’t aware that periodontal disease can indicate other health issues that haven’t been detected or treated. See your dentist regularly and make sure your smile and dental health as well as your overall health is as great as it can be. If you have silver mercury “metal” fillings, it is probably a good idea to have them replaced with tooth-colored fillings. Not only do the new fillings look better and are more durable, there is some evidence that mercury fillings can cause a variety of other health issues and diseases. The new filling material is mercury-free. You took the time to get your house remodeled after living there for a while. Or maybe you downsized so you’d have more time to spend doing the things you like to do. Now is the time to get your smile remodeled and upgraded. Get the smile of your dreams and make sure you smile will look great for the rest of your life!